Café Montmartre: With Cesária Evora and Joan Miro! I spent most of last week outside the office at a conference in Jokkmokk, northern Sweden. In fact, Jokkmokk is so north that it is within the Arctic circle. That does not happen very often since I moved to Stockholm but I knew that I would have to spend a few hours in the office this weekend “to catch up”. I had decided I would go to work on Sunday morning, which would give me the perfect excuse to go for coffee outside Södermalm. I was decided to go to Kungsholmen, which, I believe, is one of the coolest neighborhoods of Stockholm. After a few hours in the office, I jumped in the tunnelbanna (I could have walked but felt a bit lazy after last night’s concert of First Aid Kit) and was on the streets of Kungsholmen before the first song on my playlist was finished! 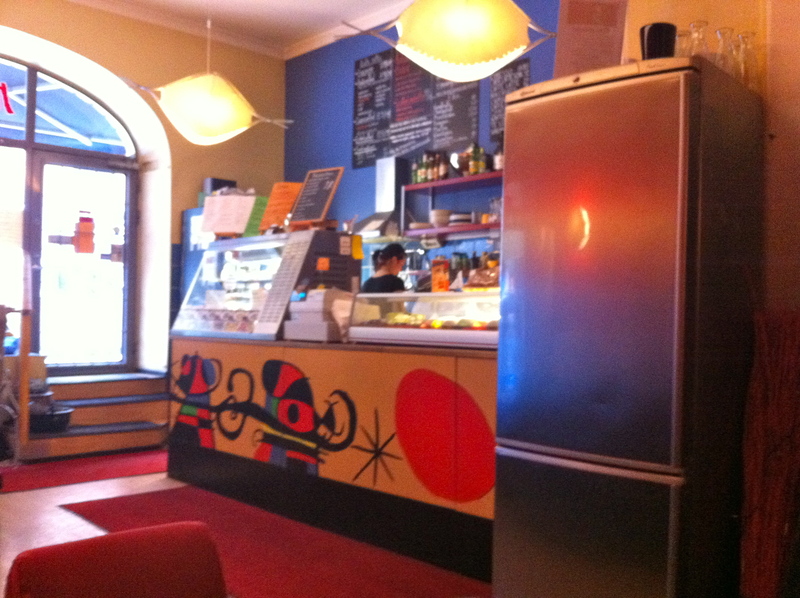 I went to a party on Kungsholmen for new year’s eve and I had spotted a few nice cafés on my way there at the time. Unfortunately I did not really pay attention to the streets on 31 December so it took me quite some time to find my way. It was another nice day today in Stockholm so I did not mind the walk around Kungsholmen. In fact, it allowed me to discover a nice park were kids had fun with a modern version of crazy carpets! 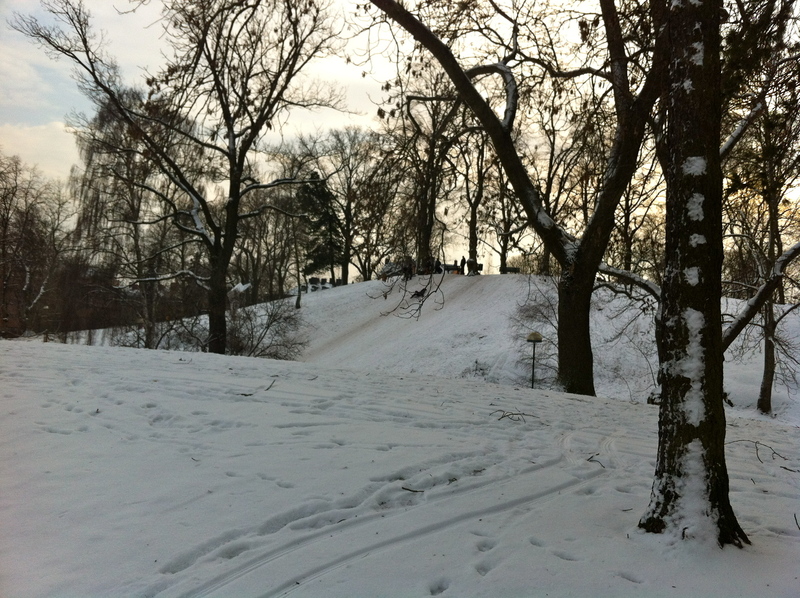 Kungsholmen might be cool but it can be a bit quiet on Sundays. In fact, many cafés were closed today, which means that those that were open were packed by the time I got there in early afternoon. When I walked pass a subway station I decided that next time I would go to Kungsholmen on a Saturday or earlier on a Sunday but now I was too hungry to keep walking around. 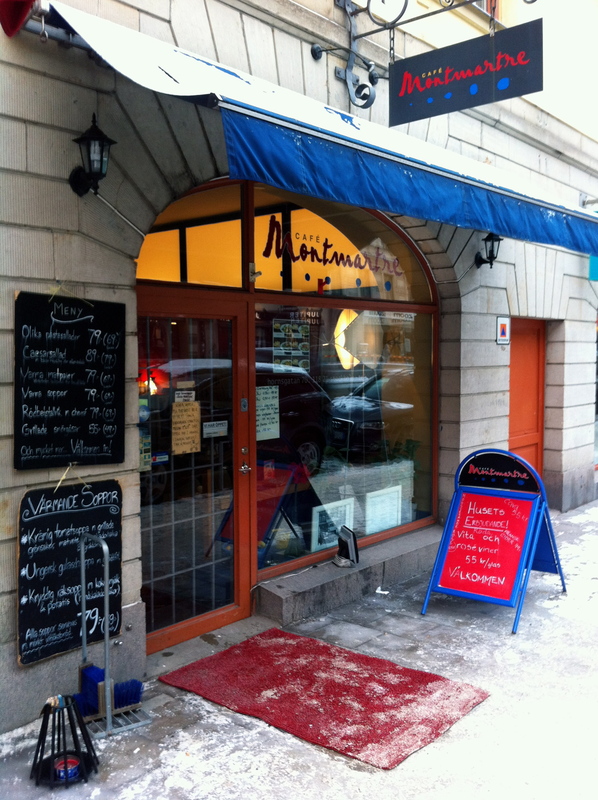 By that time, I had already decided that I would have lunch at Café Montmartre in Södermalm. On the last day of the Winter Conference in Jokkmokk, we heard a fascinating presentation by a woman whose company is providing advice on “social entrepreneurship”. While the session was framed as a discussion on “corporate social responsibility”, the presenter went a bit further and in an interactive presentation, she explained her approach to social entrepreneurship. To give you an example, she was involved in setting up micro-credit in camps for internally displaced persons (IDPs) in Thailand after the 2004 tsunami. 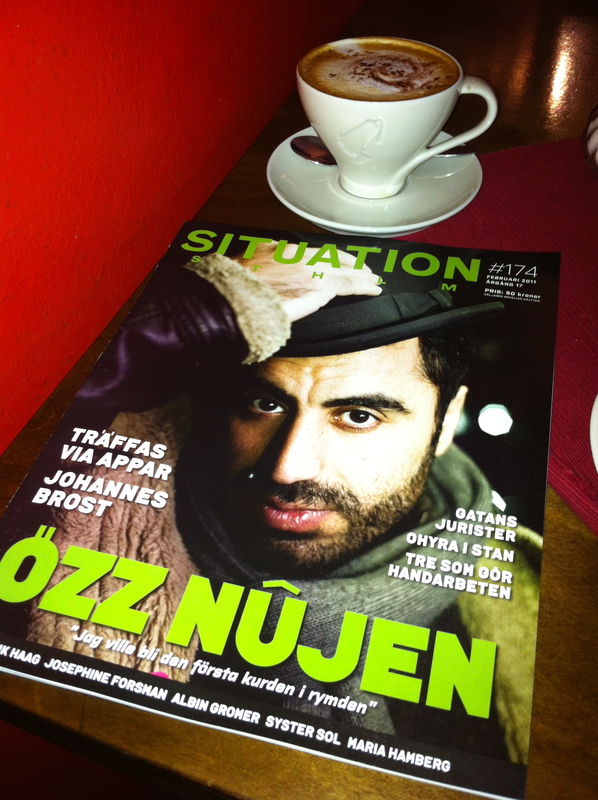 She was also involved in launching a magazine in Stockholm to support homeless people: “Situation STHLM”. This would become my contribution to homeless people in Stockholm and I bought the February issue from a guy standing outside the subway. With a copy of Situation STHLM in hand, I walked into Café Montmartre where I ordered a cappuccino and a nice salad with red beets, warm chevre and walnuts. Delicious! Having lived in Paris for a few years, I was curious to see to what extent Café Montmartre would live up to the expectations that come would such a name. 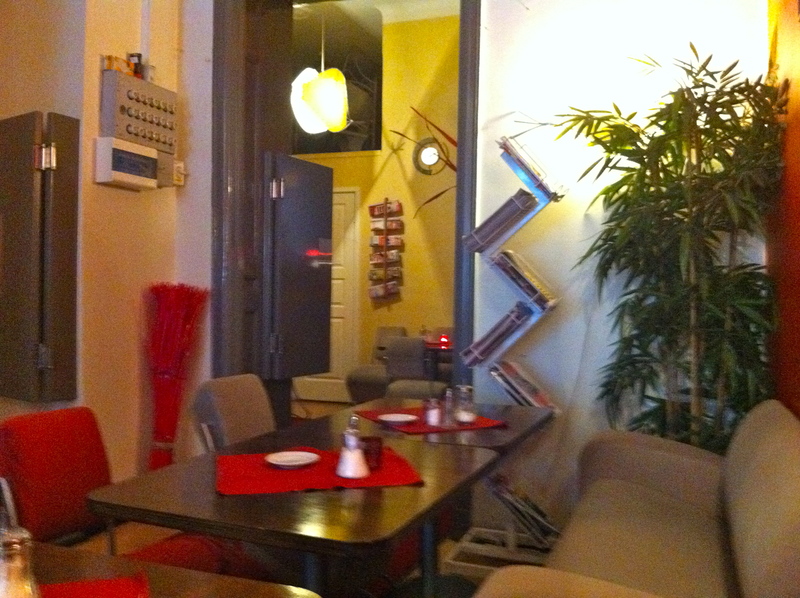 First, I must say that Café Montmartre is really nice. The furniture reminded me of the 70s. Not necessarily the most comfortable but it gives a very cool look. Café Montmartre is a nice stop on Hornsgatan. The food was delicious and I enjoyed the water aromatized with fresh cucumbers. And with such a nice facade, it is quite difficult to resist the temptation of going in when you walk on Hornsgatan. I recommend you stop for coffee next time you are in the neighborhood.